Bee Sweet on Magazine Street in uptown New Orleans is the latest entry into fashion cupcake world. I’ll be the first to admit that I don’t get the cupcake fad. $2.75 for cake and icing? The retail cost of the ingredients on your average cupcake is probably around 40 cents. Good ol’ Gambino’s sells doberge cake squares for less than $1 each. Granted, a fashion cupcake is way bigger than a Gambino’s cake square. Maybe that’s the appeal…people who wouldn’t eat two pieces of cake can wolf down one oversized cupcake and think they’re practicing portion control. Oh, and did I mention that every cupcake variety has a cute name, the babycakes are individually packaged in special boxes with holders, and each box is sealed with a decorative sticker? Unfortunately, none of these things will compensate for the perfectly adequate, but perfectly ordinary cupcake inside. Plus, these Sprinkles and Magnolia Bakery style cupcakes are all out of whack: a standard-size cupcake shoulders way too much frosting. 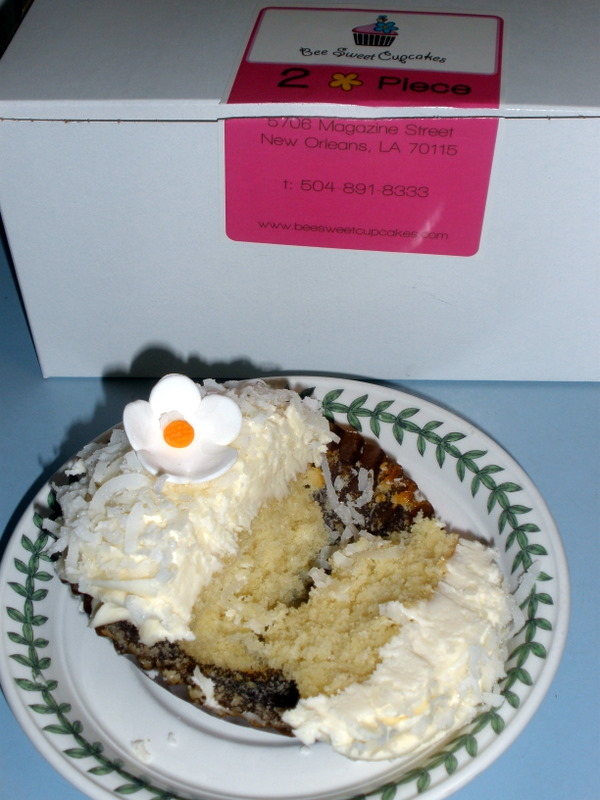 For $2.75, I’d rather have a slice of layer cake from Nola Cake Cafe on Chartres. Sliced layer cakes offer a better cake-to-icing ratio, and Nola Cake’s texture is spot-on. UPDATE: New Orleans CityBusiness writer Emilie Bahr covered the cupcake trend in a recent article. I do like the cupcakes at Praline’s by Jean. They’re not too big and actually tasty. I haven’t tried Jean’s cupcakes. So far, all of the cutesy cupcakes I’ve tasted have been far too sweet. I don’t get the cupcake rage either. I’m with ya; I do love a good cupcake, but have been disappointed from the fare at these trendy places. For the price I often find them dry. There’s something to be said for a well made cupcake, but don’t bother opening a store if you can’t do it right! I’m with ya; I do love a good cupcake, but have been disappointed from the fare at these trendy places. Well, I have to disagree. I went this weekend and the Bee Sweet flavors like the I Love Lucy (Red Velvet) and the Hecht of a Cupcake (Chocolate cake with coconut, sea salt and fresh basil icing) were amazing, very moist and not too sweet or overwhelming. Maybe try one of there more exotic flavors and you will be surprised. These were worth the $2.75 and not your ordinary cupcakes.